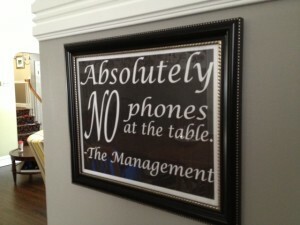 My sons are too young to have their own devices, but I wanted to set a precedent early that the dinner table is a phone-free zone. (And, obviously, adults can use a reminder, too. Reddit will still be there after the dishes are cleared.) 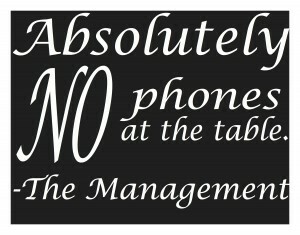 I downloaded a free trial of InDesign to make this sign, framed it and hung it on the dining room wall. Yes, there’s been some eye-rolling, but I consider it a victory that I can at least see those eyes and they’re not glued to a smartphone. Download this version here. 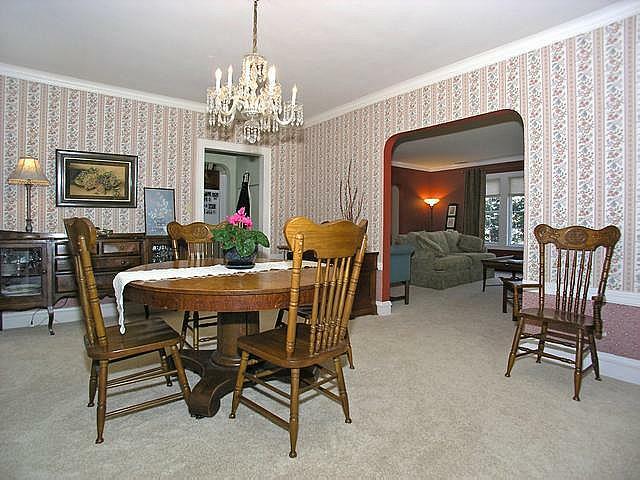 The dining room was one of the first rooms we re-decorated when we moved in, in part because peeling off wallpaper is so satisfying. Here are the before and after shots! 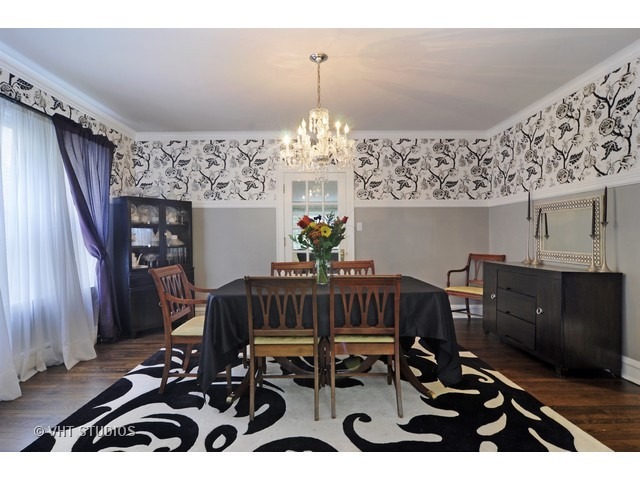 I am obsessed with this wallpaper and plan to use it again in the new house. 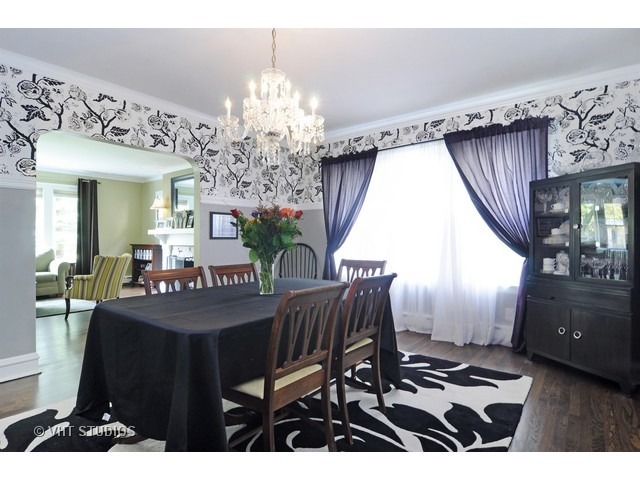 It took a while to convince my husband, but the compromise was to use a neutral gray below to offset the wild pattern. The chandelier was original to the house and just needed to be cleaned (vinegar did the trick) in order to be restored to full reflectiveness. We also pulled up the carpet and had the hardwood floors stained in a dark tone. The buffet and china cabinet once belonged to my great-grandmother, and the dining room table and chairs were once my aunt’s. 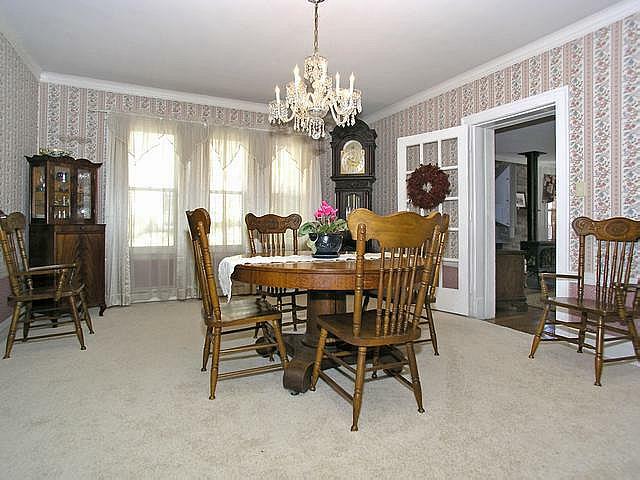 I still plan to stain or paint the chairs a darker tone, but just didn’t get around to it in this house. That, and recovering the seats, are still on the to do list. I’ll get around to it eventually. In the meantime, the kids spill spaghetti on the old fabric. 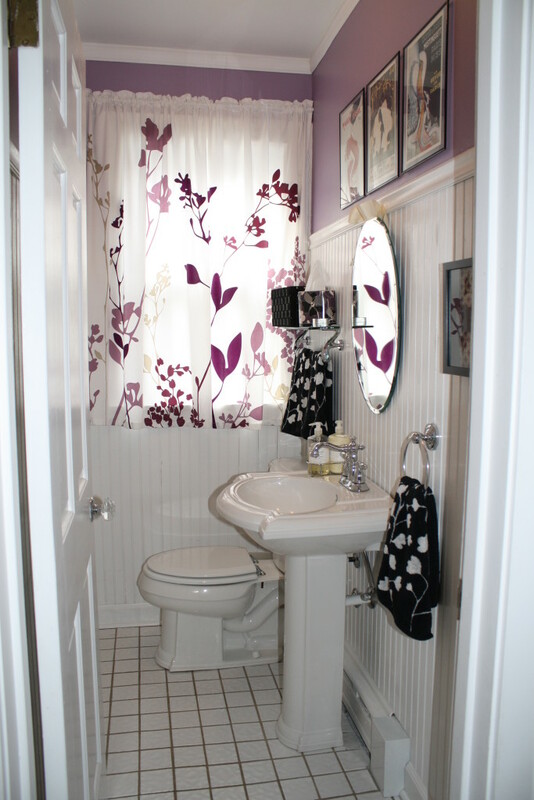 This one was a simple re-do because we couldn’t afford to rip out the bath fixtures and renovate. 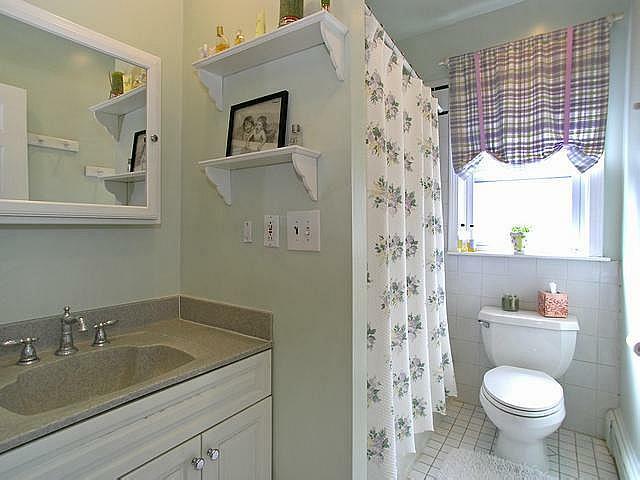 Plus, the tiles and the vanity were in good shape, even if they weren’t exactly what we would have picked out. 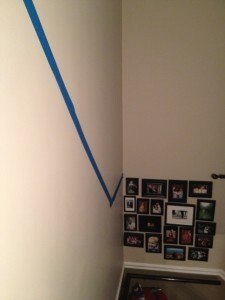 We also created the look of wainscoting without actually applying it. 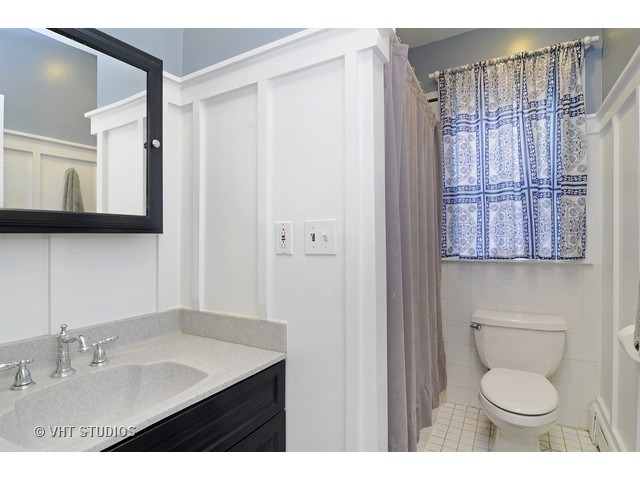 Wainscoting would have stuck out too much in this small space, not to mention that it cost more than we could spend. So we faked it. We created the look by building wood frames, and painted it the whole area white to make it look uniform. Then we painted the wall above it blue and voila! A revamped bathroom for less than $200. I wanted to make a family photo wall for years, and finally got around to it during the particularly strong nesting phase of my second pregnancy. I’ll be honest—it was a huge pain, took much longer than I expected, and made me temporarily resentful of the friends and family housed within the frames. (Lookin’ pretty smug there, Grandma. Don’t you judge me.) 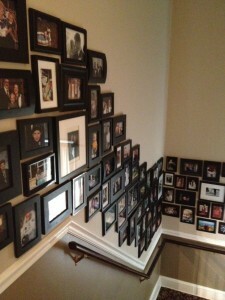 But once complete, it was happy and homey, and my kids both loved looking at the photos every day on their way up and down the stairs. Here’s a step-by-step guide that streamlines the process, sans the stops and starts I had along the way. 1.) Gather family photos together. Printing digital photos is easy enough, but I wanted wedding photos and other old pictures from our parents and grandparents, which required borrowing, scanning, and re-sizing photos. Give yourself some time for this step. (Like maybe over the course of a month.) I stuck to printing photos in 4 x 6 and 5 x 7 to keep it fairly uniform. 2.) Buy frames. 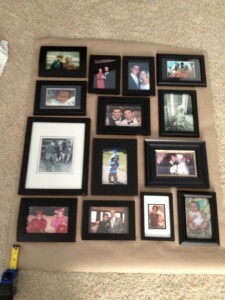 Home improvement magazines and design shows would recommend buying identical frames. This is fine if you are doing 15 or fewer frames, but is way too expensive if you need enough frames to cover a hallway. 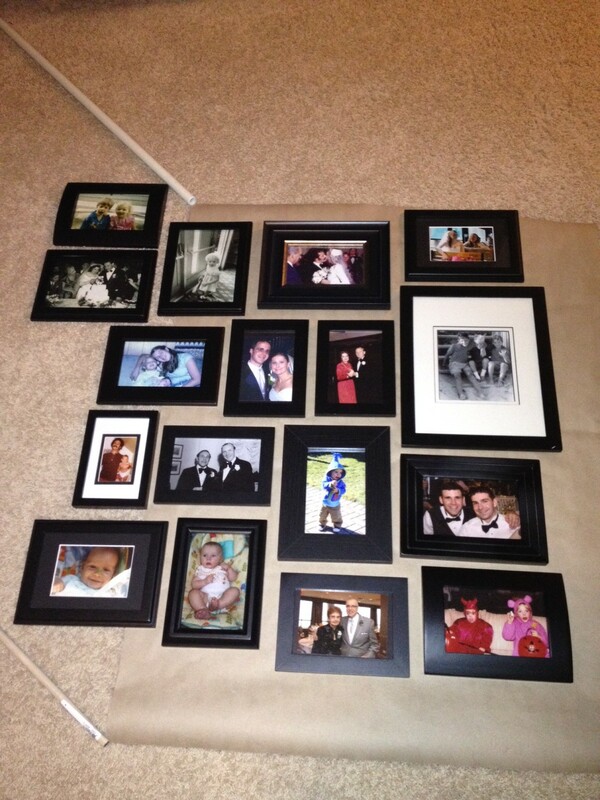 I chose a standard color (black) and bought all the 4 x 6 and 5 x 7 frames I came across over a period of four months. I mostly purchased from Michael’s, Garden Ridge, Bed Bath & Beyond, and HomeGoods, because they had the cheapest options. It created a less uniform pattern overall, but I think the random assortment is more visually interesting. 3.) Prepare the frames. Remove the stickers from the front of the glass with a razor blade and, if any of those you purchased were also table frames, remove the easel back so it fits flat to the wall when hung. 4.) Frame the photos. Place the photos in frames, being mindful of whether or not you want a standard pattern (for instance, all wedding photos in 5 x 7 frames) or if there are any other groupings you will eventually want on the wall. 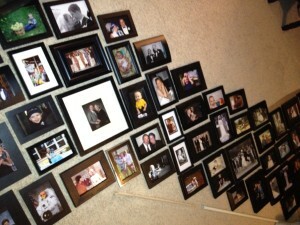 I printed all wedding photos in 5 x 7 and black and white, but varied the frame styles. 5.) Plan the wall. Decide roughly how you’d like the photos to look. I measured 1″ above our chair rail, and then eyeballed a distance above the chair rail as a top line for the photos. I placed painter’s tape down the wall to definitively show the top line; the bottom line I measured each time before hanging a photo. 6.) Plan the assortment. This step takes forever, so plan accordingly. My wall had three segments—two standard rectangles at the bottom of the stairs (pictured above), and then the long, diagonal part of the wall above the stairs. 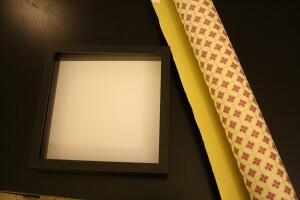 For the rectangles, I measured a piece of butcher paper in the dimensions of the area I wanted to fill with photos and played with the frames until I was happy with the design (below). Then I started filling it in with frames, playing around with different combinations and varying the assortment between black and white and color photos, eras of photos and the family members pictured. I used my bedroom floor as my workspace because it was the widest open floor space I had. I spent about a week experimenting with different photo combinations and drove myself crazy–for no good reason. Save yourself this unnecessary step by approximating a combination that you think you like, snapping a photo of it, and looking at the photo later to see if it is a pleasing assortment. For some reason, looking at it in a photo rather than staring at the arrangement itself helps prevent eye swim. hanging hardware was involved. It looked perfect on my model, but then the hanging hardware was two inches below where we wanted the top of the frame to hit. 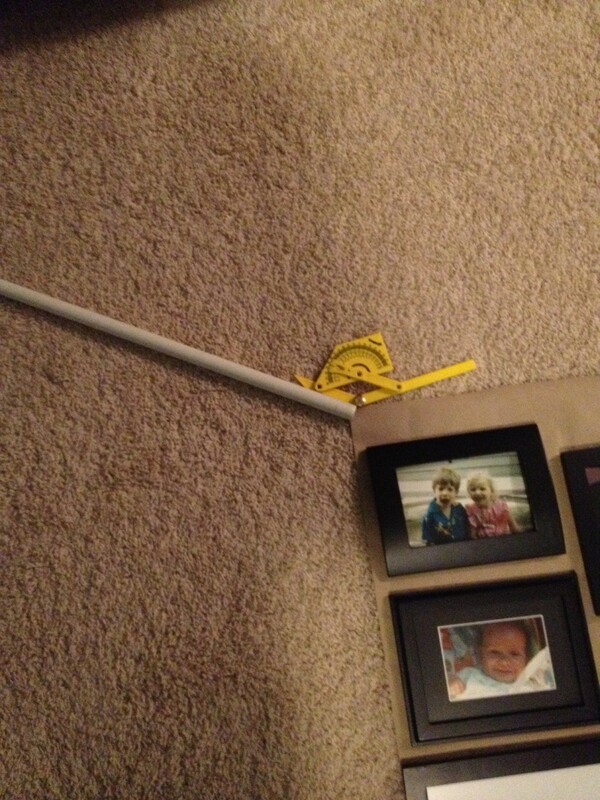 The solution: Tape a nail into the hanging hardware so it is sticking out, line the frame up where you want it, and then push the nail against the wall so it makes an indentation. Then hammer into that indentation. 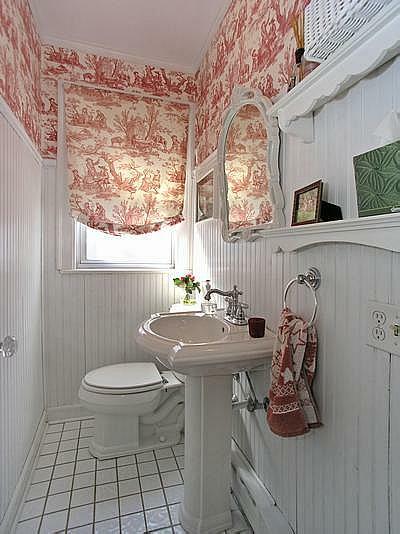 I know some people go bananas for toile. I am not one of those people. (I don’t care for pastoral scenes in any context.) Luckily the fixtures were high-end and in great shape, so the re-decorate was just a matter of taste. Farewell to toile. In addition to the wallpaper, we pulled down the shelving and the mirror to replace them with items that didn’t jut out as much into this small space. The Moulin Rouge dancers (artwork, above) I purchased from a street stall in Paris 12 years ago and had never found a place for them. Now these coquettes have a home. The curtain is actually a shower curtain that my mom retrofitted for use on this window. I also made this piece of inexpensive art (directions below) from print blocks, which I picked up at Architectural Artifacts (4325 N. Ravenswood Ave., Chicago, 773-348-0622). 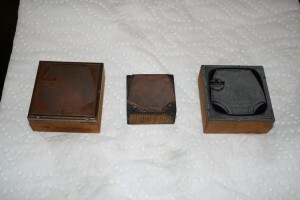 These particular blocks were used to print the labels for the infant bloomers made at the Rubens Baby Factory. (You might remember the old sign from the building on Racine and Fullerton. It closed in 2004 and and has since been razed to make way for shops, restaurants, and other things of interest to DePaul students.) 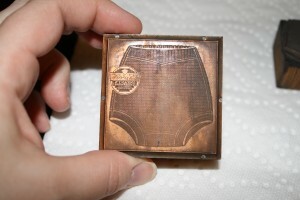 Anyway, I thought print blocked underwear was funny and a perfect fit for a bathroom. 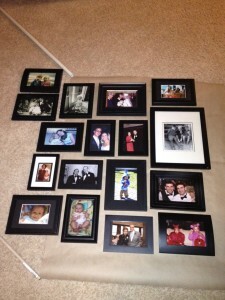 Here’s how to frame them, cheaply and easily. 1.) 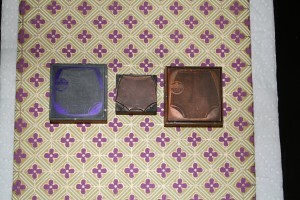 Find print blocks to provide artistic inspiration. The selection at Architectural Artifacts includes letters, old labels, print plates, and more vintage ephemera. I got all three of my blocks for less than $15. 2.) Buy a suitable background. 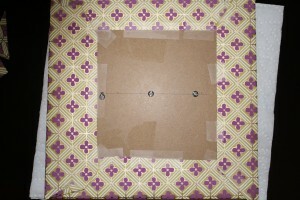 I found a piece of flat wrapping paper at Paper Source that matched my bathroom décor for $2.50. 3.) Get the frame. The Ribba shadowbox frame at Ikea ($9.99) worked well because it allowed plenty of room between the background and the glass for the depth of the print blocks. 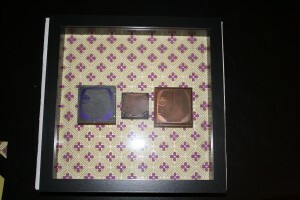 I removed the included matting for my project. 4.) 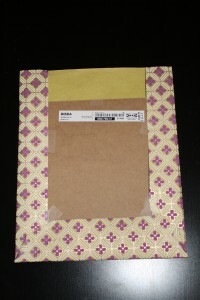 Use the paper to wrap the back of the frame like a present. Scotch tape worked just fine. 5.) Wood blocks are heavy enough that they need more than tape to stay put, so I used a power drill to attach them to the back of the cork frame. 6.) Pop the backing into the frame and done. 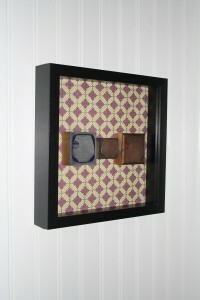 Fifteen minutes and less than $30 for a piece of creative art that is a conversation piece for everyone that uses our bathroom.